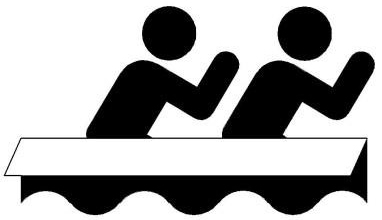 Join us Saturday, Aug 9th, 2014, from 12:00 p.m. – 5:00 p.m. on the Nanticoke River at the Public Marine Park, 26 S. Market Street in Blades, Delaware, for our first annual Recycled Cardboard Boat Regatta! Learn more: POSTER | RULES | REGISTRATION by mail or by using the link below. The Regatta is open to participation from individuals, schools, youth groups, businesses, groups of friends, and non-profit organizations desiring to build a boat and participate. This is a wonderful team-building experience, giving employees an opportunity to work together toward a common goal and have a lot of fun doing it. Registration begins at 12 o’clock, judging at 2 p.m. and races at 3 p.m. in the order listed below. Yes, cardboard boats can (well, many of them can) float. Some are engineering marvels, which can compete for the coveted Pride of the Fleet Award! For those that don’t float, we will give a Titanic Award for the best and most dramatic sinking! Some suggestions for building a simple cardboard boat can be found at: http://www.capecoralregatta.com/Index/BoatBuilding.